Campaign 1776: The American Revolution is a tactical/operational level game covering the major battles of the American Revolution from the first clashes at Concord and Lexington to the Siege of Yorktown. The game combines a detailed tactical game engine with a higher level campaign game so that the player can fight individual battles, a campaign covering several battles, or the entire Revolutionary War. Over 40 historical and what-if battles are included in the game together with a full-feature scenario editor. 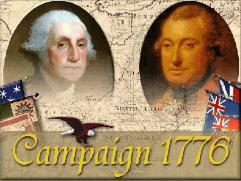 The game also includes 4 historical campaigns: Greene vs. Cornwallis, Washington vs. Howe, and Gates vs. Burgoyne plus a small campaign covering the major events of the full war.